« All I want for Christmas …. I was working in a supermarket as a checkout operator and packer in the mid eighties and I used to faithfully pack up our customer’s groceries in brown paper bags. They had a nice square bottom and placing items into the bag was easy. The mouth of the bag was always open, the sides stood up straight, and they were strong. If you were worried that it wasn’t strong enough, you could always ‘double bag’. Even better, you could always use a box and supermarkets always had lots of boxes. Once you got your groceries home, you folded the bag up to store neatly somewhere and then reused them – again and again and again. Carrying school lunches, arts and crafts (they were just the right size for a mask that fitted over the whole head) and eventually, it lined the rubbish bin. Then off to the tip, where they just rotted away as they were made of paper. Then, suddenly the supermarket brought in plastic bags. They were a pain. They did not stand up straight waiting for you to pack things into them, their mouths did not stay open, in fact we needed wire contraptions designed to hold them open, they were difficult to separate from each other and they broke easily. We didn’t like them, the customer didn’t like them. And I am sure we all knew, at least I certainly did, that they were not biodegradable. Yet here we are, twenty plus years later and only just recently have retailers ‘decided’ that they would be more environmentally conscious and customers would not automatically be given a bag. Once upon a time you couldn’t leave a shop without a bag – you had to have all your purchases in a bag to show that you have been through the checkout and everything was paid for. And more than that, to show everyone everywhere that you shopped at such-and-such shop – as their name, their logo or something that distinguished them was plastered all over the bag that you were carrying in full display. Lets face it, plastic bags are cheaper than brown paper ones, but they also acted as a vehicle for marketing. Now, twenty years later large retailers have began to sway to a growing green force and are attempting to look like they care about the environment. Sorry, I don’t buy it. You knew what you were doing. It’s still a marketing ploy due to pressure. The caring retailer. So, why did we allow it? I would have paid the extra cents for the brown paper bag in the eighties, but of course, that wasn’t on offer. You all remember going to the shop with a fabric bag with handles to carry everything home in if you were walking – the brown paper bags didn’t have handles, and could be weak if wet yet here we are, twenty years later and we are back taking our own bags to the shop. Only this time, you are made to feel environmentally insensitive if you don’t. Sorry, I don’t buy that either. However, it does go to show that we shouldn’t just accept change as a constant state that we live in. We should question, we should lobby, and we should consider the consequences. You may have thought as I did that there were no alternatives as they were not on offer, but if we know better, why didn’t we say something at the time? I guess, in the great scheme of things, getting a plastic bag instead of a brown paper bag was not way up there in terms of priorities – but the consequences of that indifference is huge. Not just in our land fills, but in our lifestyles (throw away society) and to the wider environment including dolphins and other marine life as these plastic bags have caused deaths. Of course, the more you know, then the more you can make informed decisions. The more you understand, the more you can predict consequences. 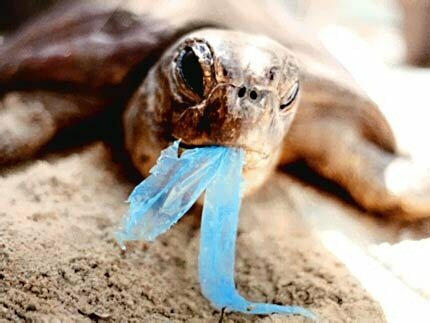 Did everyone know that plastic bags posed a potential risk to the environment? I did but I had studied science up to seventh form and was going to university to study it some more – was I unusual? One of the biggest requirements of a school science curriculum should be to provide scientific literacy to all people – that is why it is a compulsory up to year 11. Perhaps everyone was aware that plastics posed a problem and the missing element was action – and being able working together to find solutions. One of our requirements as tertiary educators is to try and fulfill educational requirements for our society – provide resources to our supposed knowledge economy, provide work ready skills but we mustn’t forget our responsibility to support society as a whole. As a democratic society we need to ensure that people are informed and have the ability to make decisions about their lives and have the mechanisms to be able to take action if the need ever arises. People could argue that is the role of universities but I disagree, all people need to be able to participate in society and have the ability to make informed decisions on issues that may affect their future. Incorporating these life skills into our teaching and learning is a challenge, but a necessary one that we need to meet. This entry was posted on January 24, 2010 at 10:25 pm and is filed under Article. You can follow any responses to this entry through the RSS 2.0 feed. You can leave a response, or trackback from your own site.